You are welcome to join us for our monthly outings. Come and enjoy the fun! on the first Wednesday at 5:30PM (Walk-ins allowed). It’s FL QSO PARTY TIME! 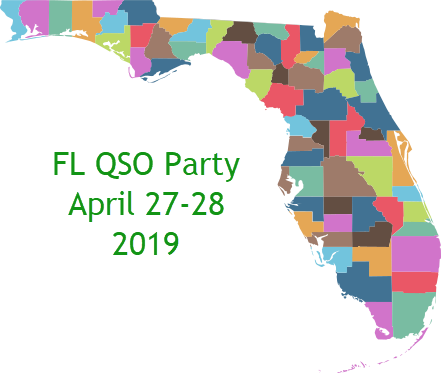 We will be going out for our regular monthly meeting but wanted you to have a head’s up about the Florida QSO Party that will be starting a noon EDT. Might be a few stations checking setup and propagation before start time. If you plan to stay over to make a few QSO’s as things get started at noon, be sure to plan to bring water, a snack or lunch, and perhaps an extra battery or solar charger! Breakfast and brag time at Cracker Barrel in Sanford, FL will start at 0730. Got a new toy you want to show off? This is the time to do that! About 0900 we should be setting up in Sylvan Lake Park. Look for us in Picnic Area A past the soccer fields on the left and follow the road signs. If many operators show up, we may have to spread out a bit to avoid interference with one another. If that area has been reserved try areas B and C. Sometimes youth soccer can bring a crowd so watch out of little ones and look for our cars and antennas. Should be a good time for both SSB and CW modes during the QSO contest and Sunday when the time’s running out, it is amazing how well QRP stations can be heard giving away points to the big guns. Contests are for fun, so come out and play radio with us. Have some fun!